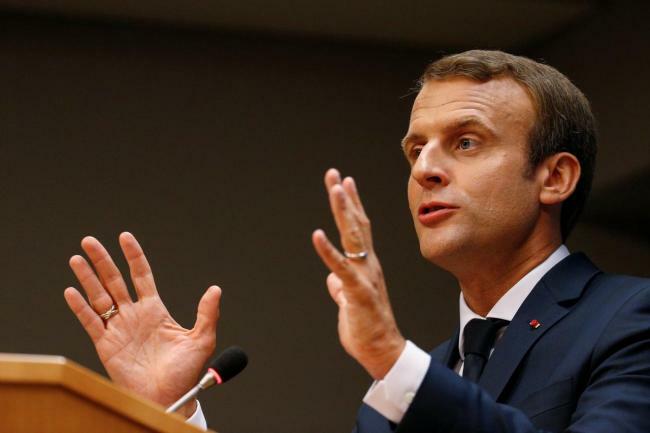 WASHINGTON -- French President Emmanuel Macron‘s talk this week of a “new deal with Iran” may not, in fact, represent anything new nor a deal with Iran. Macron, followed by German Chancellor Angela Merkel, came to Washington in hopes of persuading President Donald Trump not to reimpose sanctions on Iran before a May 12 deadline and imperil the 2015 Iran nuclear deal. Under the accord, Tehran agreed to limit its nuclear program in return for relief from US and other economic sanctions. The deal, struck by Britain, China, France, Germany, Russia, the United States and Iran, is called the Joint Comprehensive Plan of Action. Macron’s “new deal,” at first glance, appeared an effort to rebrand something already under discussion between the United States and three European allies -- Britain, France and Germany -- to try to save the existing agreement. “This is, indeed, consistent with what we have been talking about for six months,” said a French official on condition of anonymity, adding that Macron hoped to persuade Trump to stay in the existing deal with the fix under discussion but also to keep the door open to further talks even if he abandons it. Trump on Jan. 12 gave the three European nations an ultimatum to “fix the terrible flaws of the Iran nuclear deal” or he would refuse to extend US sanctions relief on Iran. Key US sanctions will resume unless Trump issues fresh “waivers” to suspend them. Trump sees three defects in the agreement; a failure to address Iran‘s ballistic missile program; the terms under which international inspectors can visit suspect Iranian nuclear sites; and “sunset” clauses under which key limits on the Iranian nuclear program start to expire. Negotiators among the United States as well as the three European powers have been working to try to finesse these issues so as to keep the US in the agreement without driving Iran -- which opposes any changes to the deal -- out of it. At a news conference with Trump on Tuesday, Macron said he wanted “to work on a new deal with Iran” to address four things: limiting Iran’s nuclear program in the short term and long term, restraining its ballistic missile activities and curbing what the West sees as its destabilizing behavior in the Middle East. Perhaps in reaction to Trump’s opposition to the JCPOA, Macron appeared to be trying to preserve space for diplomacy even if Trump revives US sanctions on Iran in a few weeks. “The impression I get is that ... he simply wanted to preserve some kind of perspective of a political process even if there is a negative decision on May 12,” said the diplomat. The diplomat suggested that Macron hoped to limit the hard feelings that would be created by Trump‘s withdrawal from the JCPOA and to “keep, somehow, the door open” for further talks. Such talks, however, would in all probability be among the United States and the three European powers, but not with China or Russia, let alone with Iran.